Hello there, you kooky people, you! Are you in for a treat! 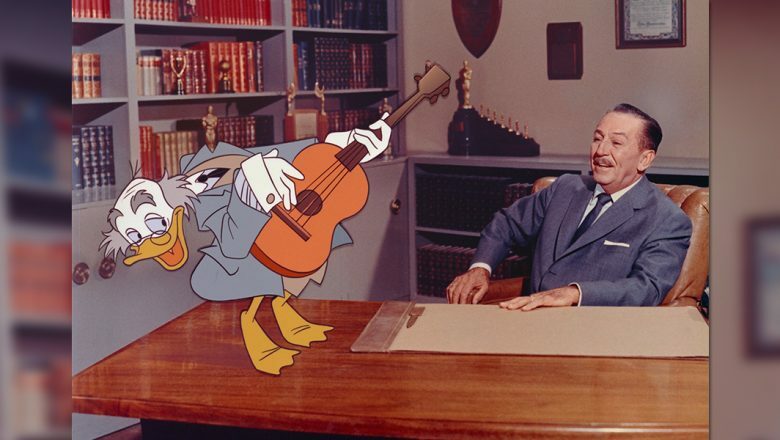 Fifty-five years ago—on September 24, 1961—the egotistical, erudite, eccentric professor Ludwig Von Drake made his debut on the premiere episode of Walt Disney’s Wonderful World of Color. The only major animated character Walt created especially for television, Professor Von Drake is Donald Duck’s father’s brother. (According to no less an authority than Walt himself, he has a different last name because Donald took his mother’s name when he went into show business.) As quoted from Von Drake’s official bio by Walt Disney, Ludwig is “an eminent psychologist, renowned color expert, etymologist” and “the most sought after lecturer in the world. 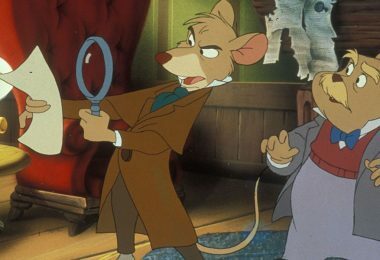 He is undoubtedly the outstanding genius of the century”—apparently also an author for as Walt said, “Undoubtedly, the Professor must have written this himself!” Since that wacky quack is always ready to celebrate himself, join in the double-nickel festivities as D23 presents eight fun facts about that lovable lunatic Ludwig. Walt Disney’s arrival at the forefront of color television programming in 1961 was big news. His move to NBC, “the Color Network,” from ABC, home to the Disney TV hour since 1954, made headlines. 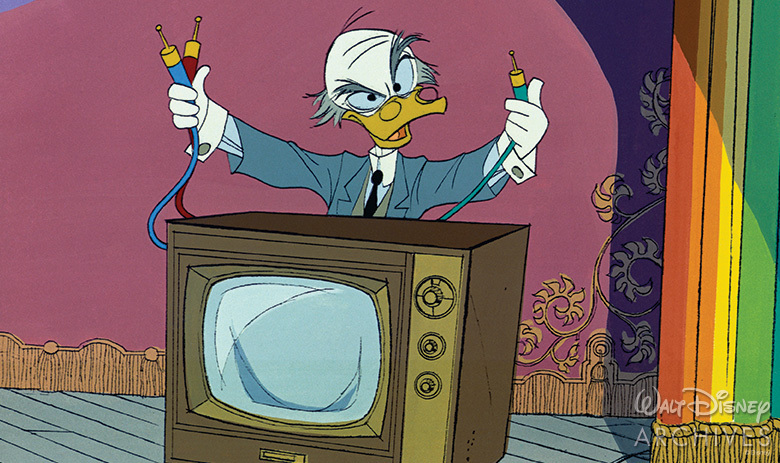 To signal his serious intent to produce must-see full color broadcasts (make that “colorcasts”) the great showman created an all-new animated character—and Ludwig Von Drake burst on to the scene, holding forth on “An Adventure in Color/Mathmagic Land,” the first Wonderful World of Color episode. Ludwig lets looses with the first of his loony lectures, on color, of course, especially as seen via color TV. Bird meets birdbrain when a Disney-fied depiction of the peacock—symbol of NBC‘s “living color” since 1957— makes a surprise cameo appearance. When the animated peacock’s famous feathers upstage Ludwig, the newly introduced TV star retorts, “Oooh, what a show-off!” Ludwig then tells the viewers with a wink, “Confidentially, he dyes his feathers!” Von Drake also takes a satiric stab at the peacock in the 1963 episode, “Fly with Von Drake.” When Ludwig calls his seagull pal, Orville, “a seagoing peacock,” the bird’s tail feathers fan out in an array of “living color” hues. Aside from indicating the importance of the new version of his weekly primetime TV series, Walt created Ludwig Von Drake in order to ensure a regular stream of new Disney animation on TV. 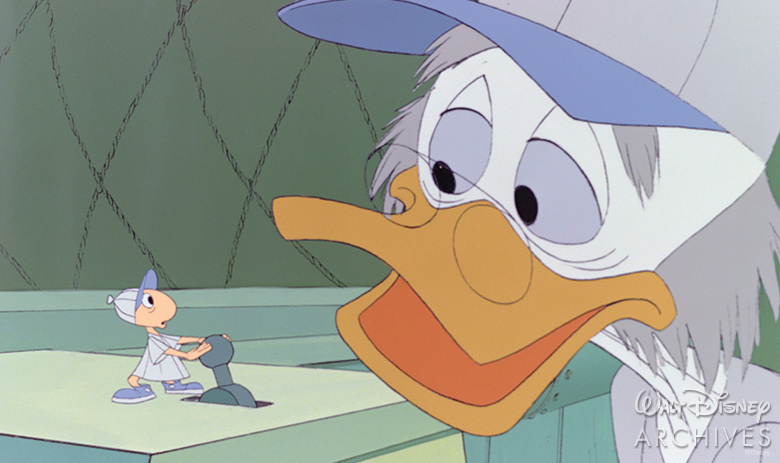 Putting his best food forward for his new web-footed star, Walt called on his elite team of animators, the Nine Old Men, to introduce Ludwig on his first appearance 55 years ago. Seven of the Nine served; Ollie Johnston, Eric Larson, Ward Kimball, Les Clark, Frank Thomas, John Lounsbery, and Milt Kahl turned their special Disney skillset to Ludwig’s multi-hued performance on that first animated Walt Disney’s Wonderful World of Color episode. 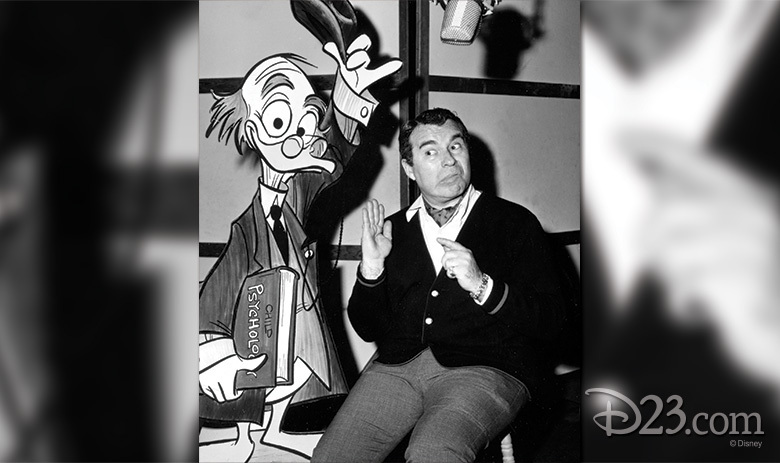 One of Walt’s favorite voice artists, Disney Legend Paul Frees, is the vocal powerhouse behind Professor Von Drake’s zany on-screen personality. Gifted with a three-octave vocal range and an unerring ear for impressions, Frees was also a talented actor who skillfully performed many an audio characterization. His vocal improvisations helped shaped the Von Drake character beyond simply a wild Austrian accent. “When we have a story conference, the writers toss questions and situations at me,” Frees once revealed. “I ad-lib on tape and it’s incorporated into the script. Walt Disney gave me a lot of liberty in portraying the Professor, and I’ve made him more personal than any of my other characters. Originally, Ludwig was a supercilious character but we’ve given him point and shade as we brought him along. His complete knowledge in every avenue helps bring a little culture to TV.” In addition to non-Disney vocalizations—including one half of the Beatles (John and George) for the animated series about the band—and any number of characters for Hanna-Barbera, Jay Ward and Rankin-Bass, Frees voiced a variety of Disney roles, including many of the buccaneers in Pirates of the Caribbean and the weirdly welcoming Ghost Host at the Haunted Mansion at Disneyland® Park. Curious to see Ludwig’s voice on screen? 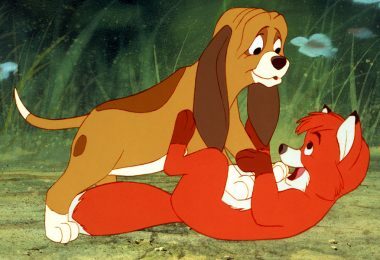 Try Walt Disney’s The Shaggy Dog (1959), wherein the versatile Mr. Frees prophetically played a psychiatrist just a few years before voicing the animated “duck-ter” of psychology on TV. What did Walt Disney watch on TV? Why, The Von Drake Report, of course, as seen on the 1961 World of Color episode, “Carnival Time.” As Walt relaxes in his armchair with his miniature poodle, Lady, he switches on his living room console via remote—only to be startled by the over-the-top intro to the “special, special, extra special Von Drake Report.” Ludwig’s TV news show really displays the Von Drake versatility, for the show is produced and directed by the wacky web-footed virtuoso, who also serves as “ace commentator.” Aside from those many Von Drake vocations, Ludwig emphasized academia, reveling in rants and ramblings about geometry, geography, atomic energy and especially psychiatry. 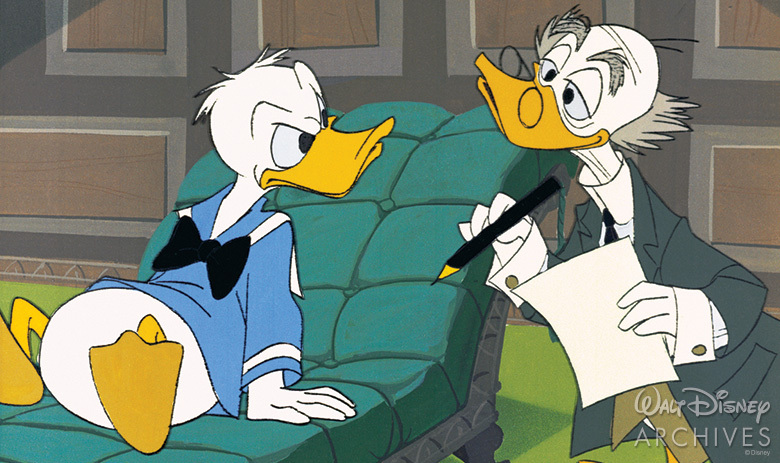 In “Inside Donald Duck” (1961), the learned loony actually succeeds in curing Donald of his infamously fiery temper—until Ludwig presents his nephew with the bill. Donald blows his top, causing the Austrian egghead to crack up and begin psychoanalyzing himself. And in DuckTales the learned professor took on perhaps his greatest challenge (since Donald anyhow) as psychiatrist to Launchpad McQuack in the DuckTales TV series. Is this self-proclaimed expert on everything all he’s quacked up to be? Nothing stopped Ludwig from lecturing at length about a kaleidoscopic variety of Wonderful World of Color topics, from travel in “Mediterranean Cruise” (1964) to philosophy and safety in “Man Is His Own Worst Enemy” (1962). Referred to as “our self-appointed expert on everything” by Walt Disney, musicologist Ludwig illustrates melody in “Music for Everybody” (1966) by writing “a lot of do-re-mis, fas, fee-fees and loo-loos all over this music score sheet.” Inspired by JFK’s famous physical fitness program, Ludwig introduced his own program in 1964 with “In Shape with Von Drake.” After Walt set up the show by playing a record entitled “Von Drake And His Musical Muscles,” the all-around authority dementedly delved into the world of sports and exercise. Showing his propensity for getting sidetracked, Ludwig used a dumbbell to create a not-so-hidden Mickey, making a makeshift Mouseketeer hat his own by singing “L-U-D-W-I-G V-O-N D-R-A-K-E.” This talkative quack-up also crashed the spoken-word recording trend of the 1960s by yakking it up about color theory, music (singing some specially composed Sherman Brothers songs along the way), and the art of sound recording on his own LP album, Professor Ludwig Von Drake. Once available only as a vinyl LP “licorice pizza” this classic comedy album is accessible today on iTunes. Ludwig jumped from the television screen to the printed page with the book-loving prof appropriately becoming the subject of such hardcover classics as “Ludwig Von Drake, Dog Expert.” In addition to being awarded his own comic book title, Ludwig also joined the comic-page cast of the classic newspaper strip drawn by Disney Legend Al Taliaferro and written by Bob Karp. 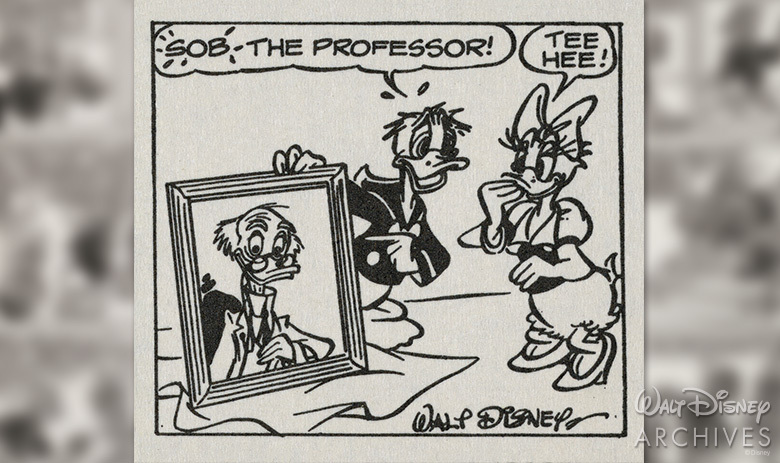 On September 22, 1961, Donald starts preparing for the arrival of the “all-around genius” from Vienna by redecorating his guest room with a telescope, test tubes, and maybe even a “hunk of uranium 255.” Donald unveils an oversized painting of his Uncle Ludwig (sent as a gift by the Professor himself) in the Sunday color comic page published on September 24, 1961—the very date Von Drake debuted on Walt Disney’s Wonderful World of Color. From that point on, Ludwig was a supporting star of the Donald Duck strip for the next four decades. Such a talkative talent needs someone to converse with besides the television audience, so Ludwig was given a pet named Herman to interact with. A bootle beetle—that particularly Disney species of insect—Herman popped up from time to time to help Ludwig with his presentations. In “The Hunting Instinct” (1961), for example, Ludwig’s tiny friend runs the projector to screen The Von Drake Plastic Hour (parodying such TV series as The United States Steel Hour). In “Music For Everybody” (1966), Ludwig introduces his own 99-piece orchestra made up entirely of bootle beetles. Herman and his musical pals also appear as the Bughouse Five, a spoof of the Disney-artist jazz band, Firehouse Five Plus Two, headed by frequent Ludwig animator Ward Kimball. Ludwig considers Herman his best friend—when the absent-minded prof isn’t almost accidently squishing his bug buddy. In addition to playing it up in various video games, this Teutonic-tinged television star continues to thrive in TV productions. 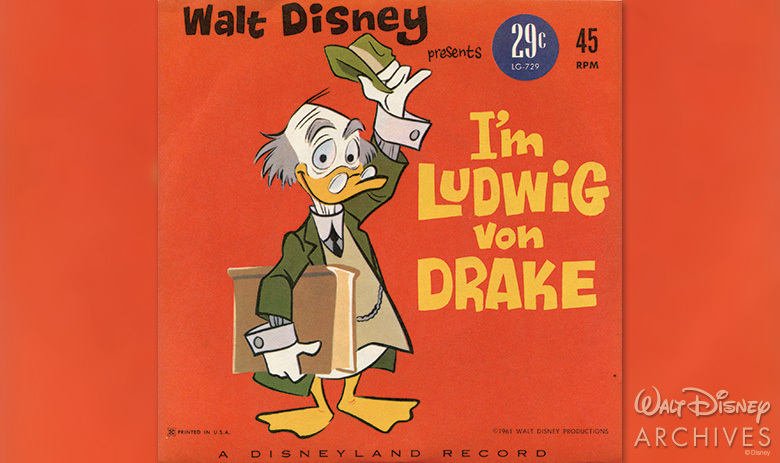 Living up (if not lousing up) to his status as all-around authority, Ludwig starred in his own segment, “Ask Von Drake” on House of Mouse, and his tricky song wherein the wacky vocalist rapidly rattled off an endless list of Disney characters has become a YouTube favorite. 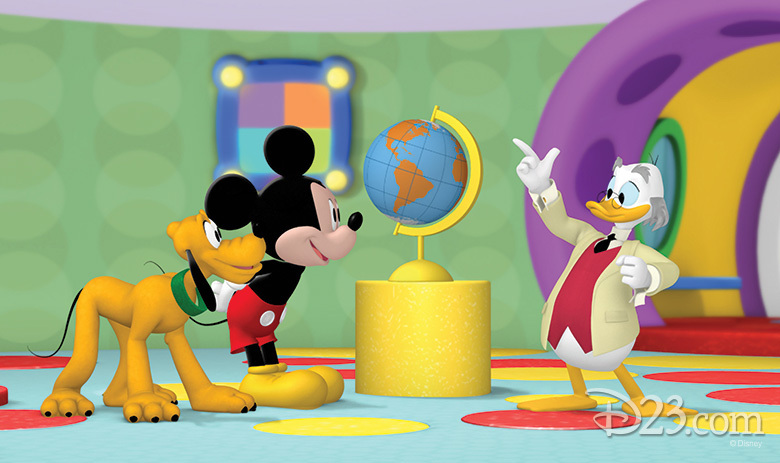 On Mickey Mouse Clubhouse, Von Drake invented the titular high-tech clubhouse, equipping it with outlandish accessories, including the Handy Helper. Ludwig’s crazy inventions often help out Mickey and his pals, as when Ludwig returned to his World of Color roots, inventing a device that restored color when it was being drained from the world. In the stylized and crazily creative Mickey Mouse series of newly produced cartoons, the kooky professor fits right in. 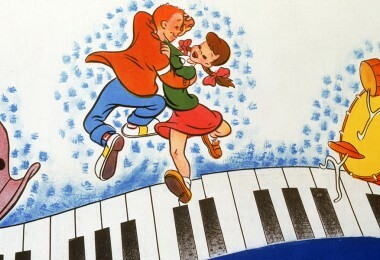 This Disney favorite continues to delight video audiences whether or not they are aware of his zany television debut 55 years ago. Happy anniversary, Ludwig Von Drake!